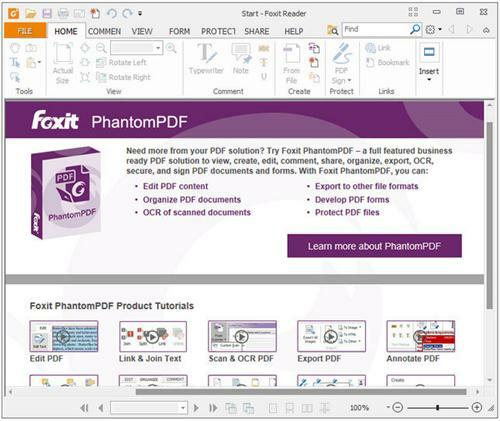 Foxit Reader is a PDF document viewer, with incredible small size, breezing-fast launch speed and rich feature set.Foxit Reader is designed for a broad spectrum of users including enterprise and government organizations. Foxit Reader is fully customizable to meet any organization business objective and its small footprint makes it easy to deploy. It is also packed with features not available in competitor's products. Foxit Foxit Reader's small footprint makes easy to update and maintain. Finally, Foxit Reader adheres to all ISO 32000 standards. This new feature enables you to interactively fill out a PDF form, export it as a FDF file, e-mail it and save it together with PDF document. Different from other PDF Reader that always silently checks for updates over internet, Foxit Reader 2.0 won't automatically visit website without your permission. It starts to update merely when the time you open a specific document which cannot be properly displayed for missing modules support, for example CJK support, and JBIG2/JPEG2000 decoder etc. Foxit Reader 2.0 supports dynamical UI language switch. English is the default UI language, but you can select a localized language from the Language menu. With this new feature, Foxit Reader self-upgrade, you don't have to manually download a new version from website, only need to click on "checking for updates now" from the Help menu. Update manager will search for a latest version available on Foxit server, download and re-install it. Foxit Reader highly respects the security and privacy of users and will never connect to Internet without users' permission. While other PDF Reader often silently connects to the Internet in the background. * Supports Touch Mode when working on touch-screen devices. * Convert .msg files (emails) to PDF using the right-click context menu in Windows Explorer. * Add an option to automatically save PDF documents at regular intervals in case of system crash or power failure. * RMS security enhancements (Enterprise Packaging only). * Preserve formatting when copying tables from PDFs. * View custom metadata in PDF. * Print PDF sections/pages directly from selected bookmark(s). * Support for SharePoint 2016 version. * Cut, delete and move multiple bookmarks at a time. * Pin the most used SharePoint, OneDrive, Google Drive, and Dropbox folders to the File > Open/Save As panels in Foxit Reader for easy access. * Fixed some security and stability issues. Click here for details. Foxit Reader v8.0.2.805 (Portable) download links are externally hosted on Extabit, Rapidshare, Rapidgator, Netload, Uploaded and Foxit Reader v8.0.2.805 (Portable) also available directly on Torrent Sources.